If you follow us on Twitter, you’ll notice that I put a call out earlier today for people who’d benchmarked their Raspberry Pi 2 – I wanted to be able to share some benchmarking results with you this afternoon. Our old friend Dave Hunt (click on that link – it’ll take you to some of Dave’s projects, which are among the most beautiful we’ve seen made with a Raspberry Pi) has done some thorough benchmarking against a range of other devices. Click on the table to learn more and to see some very illuminating graphs. The good folks at Adafruit have also been busy benchmarking, this time against the B+, and they also found themselves coming up with some really impressive results (a 7x improvement in some cases); click on the image to learn more. Finally, here’s a really nice side-by-side comparison of the browser experience of the old B+ and a shiny new Pi 2. I recognise that second website Marco Barisione visits. I wish to complain about the 2B as my coffee consumption is taking a hit because you’ve made it too fast. I used to be able to brew 20fl.oz. of coffee in the time it took to compile GnuCOBOL as it’s normally take about 16 to 18 minutes to rebuild from scratch & perform all the unittests Now it takes between about 5 minutes. and even less if i only do recheck of the unittests. That really isn’t enough time to a fresh coffee and i haven’t been able to make a sandwich to go with it in days. Are you making coffee with the Pi? Where’s the project? Isn’t there a project where someone made a coffee maker out of a rpi? Strange. On one side there are 17 to 28% improvement; on other tests it runs 33 to 44% slower. That’s very strange – that’s not what we’ve been seeing. We’ll get someone to have a look. The tests where I notice improvements are very graphic-oriented. The tests being slower are background ‘broadcast’ related. This is all based on nuscratch from the current raspbian distribution. Think the squeak underlying is possibly overspecialized for Model B?? There is nothing in NuScratch that is ‘over specialized for the model B’. The broadcasts are done via perfectly normal socket APIs, so any change in performance there will be down to lower level changes. I’m sure we’ll find out soon. This ‘slow test’ is a complete internal ‘broadcast’ test, no scratch sensor network involved. Of course I did another test involving remote socket connections, showing similiar results. Looks as if scratch internal broadcast system is affected. I’ll post the code in the the forum. I wrote a (unfinished) demo that renders Mandelbrots using GPU shaders, where the CPU only provides coordinates and plays some music. That one also runs slower compared to the B(512MB). That’s interesting; I’d expect it to be the same speed, not slower (the added performance comes from the extra CPU cores, so GPU exercises should be like-for-like). Are you sure you are not stalling waiting on responses for expected time/duration of work? If the procedure (for example) takes 10ms and the pi2 is working in 6ms, but stalls for 18 to catch up to when you expect a response? I haven’t created any complicated code within Scratch, but if nothing else the Scratch user interface is much faster. I ran a 10 week CodeClub running Scratch on the original Raspberry Pi and whilst usable I did have to tell the children to be patient when there was a delay between them clicking and Scratch responding. I ran Scratch on my Pi 2 and my son’s Pi B+ and there was a noticeable delay in response from the GUI when creating a program on the old B+, but it was pretty much instant on the Pi 2. This is a big improvement and makes the Raspberry Pi much better. Both were running the latest NOOB image. Raspberry Pi 1 (1x 700MHz ARMv6, 512MB RAM, Raspbian Wheezy): Average 1 frame per second. 18 mins to complete. This has interesting ramifications for the Foundation’s stop-frame animation tutorial I’m planning for Cotswold Raspberry Jam (next event probably Sat 18 April). When my daughter Annabel did the stop-frame tutorial at Pycon, time limitations of the Jam required her to use Ben’s Intel laptop to render the .JPG frames into a video file, because the Pi 1 would take about 2 minutes per frame to render – it wouldn’t have been finished by the time the Jam finished. With the Pi 2’s performance, it looks like this will be practical to render on the Pi 2 itself, live during the event. Do you have a copy of that video file? Or can you repeat the test on a Pi2 with a freely available video please? I’ve got a HP N36L Microserver I do transcoding on and I’m actually wondering if using the Pi2 is going to be faster, so I’d like to compare the speeds. Okay, using the Big Buck Bunny trailer, 480p, transcode from Quicktime to h.264, 128kbps AAC. Actually, repeating the sysbench tests show that the N36L is still about 7x faster still than the Pi2, so I’m guessing ffmpeg is going to be slower. Oh well! Still can’t wait to receive my new Pi! I recompiled x264 for cortex-a7/NEON and got a 30x improvement in sped over the Pi1. I would expect similar improvements for other codecs, if they use NEON. I ran the wolfram mark system comparison …had some licensing issues at first but then rebooted and it finally worked .. this is from the jan 2015 raspian distro..
just amazing the difference .. Looking at the Mathematica benchmark’s it appears for some tests, such as test 9, that the pi2 is 21 times faster. The is the kind of speed up one would expect between software float and hardware float. Is it possible Mathematica on the original PI is not making use of hardware float? Alternatively this could be a low memory swap issue. Any idea which? The memory issue can’t be fixed, but hardware float on the original PI is certainly possible. Very preliminary results from last night showed that compiling FFTW3 on a PI2 with and without the NEON SIMD extension produced a 25% improvement in FFT speed. Tests agains PI1 this evening. Compiling OpenCV 2.4.10 in 34 minutes on the Pi2 is quite an improvement compared to 10 hours on the Pi1 . I was going to ask about OpenCV. That’s an amazing improvement, I assume that it improves things for the operation of OpenCV a as well. It’ll be really awesome to improve the vision analyses abilities and have more robotic eyes! I’m guessing that big speedups in compiling large projects has something to do with memory size, as well as the CPU. If you have to use a swap file on flash due to 512MB memory limit, it has a big impact. Not really a benchmark, but OpenArena runs at a solid 60 fps on the new pi! Tremulous 1.0.2 too! Haven’t tried Quake3 yet but it should also play smooth as butter. I’ve also try OpenArea and was amazed to see it running butter-smooth on the RPi 2. Well beyond my expectation, which was “hopefully slightly less jerky” . Any power consumption comparrisons? Although completing tasks quicker probably requires more intense power consumption, is it more efficient overall? Has anyone pointed a thermal camera at Pi2? Has anyone compared JVM performance between the two? In theory, the 4-cores should make a _huge_ difference in garbage collection performance if you use one of the concurrent collectors like G1. Dosbox compiled with dynamic core for 2B with neon: Wolf3d is smooth as butter and descent (late 486 era) has a reasonable frame rate. I may, or may not, have discovered the wonderessness of time mismanagement for resources when playing this game at university. Especially on the ‘Oh, it will be a quick game’ at 9PM, and I’m still playing at 6am…. I’m still waiting. It’s expected next monday. We were talking about this last night: in terms of how long it took us to build and ship the original 2012 batch, we’re already up to July on day five! Got My Pi2 tonight … LOVE it! But … Worth mentioning that much of the software/distros are in alpha or beta so that although Pi2 is MUCH faster it’s a little less stable than the B+ which is pretty rock solid. .. openelec I’m testing is only 2 days old … Great Pi which will get greater with development! Thankyou!!! I´d really like to know if there´s a big difference when using Openelec. I´ve been using it for some weeks now on a B+ without overclocking and it feels fast enough – I don´t have a huge video library I must say, all I do is watch some videos stored on an external HD and some stuff off youtube, so the GUI for me is pretty responsive, but maybe if I had a bigger library the B+ “limitations” would appear more obvious. There’s a VERY big difference in the responsiveness of the library; menus are like butter off a hot knife. Just read this on the openelec site ..
Is that a Pi2 thing or was this possible with a B+? That change was introduced on the B+. Using the add-on is MUCH slicker on Pi2 with very reduced wait times. openelec boot times and add-on install times are almost the same on my A+ compared to my B+ … The size of ram doesn’t seem to worry OE .. The processor seems to be the important factor. I am noticing a big difference on emulation like the Amiga and Super Nintendo. Now they run smooth and there is not a stutter in sight. This is great work for anyone who wants to make a gaming cab and what a small form factor with low power. Our STEM club were well chuffed with the Pi, and set up a quick, if arbitrary benchmark within minecraft using 5x5x5 cube of TNT. We recorded a youtube video of a Pi2 and a B+ side by side. Result: The Pi B+ is roughly twice as fast to calculate the effect of the explosion of the TNT block! Maybe I am overlooking something. But no one in the tests above (at least the video render or minecraft) examples say what kind of storrage is attached. I hope all those tests use card which habe been checked with a benching tool verifying identical read / write speeds. How does the Raspi 2 compare to a Cray 2? Vax 11/780? SGI Origin (or O2)? Sparcstation 20? The strength of the Cray was in floating point performance, hitting 1.9GFLOPS. The GPU in the original 700MHz Pi was clocked at 24GFLOPS. But ignoring the GPU, the ARM core at 900MHz should run to at least 0.05 GFLOPS, and you’ve got four of those in a Pi2, running to 0.2 GFLOPS with a trailing wind. To beat the Cray you’d need an array of a dozen Pi’s which would set you back over $500 – but that’s a lot less than the $16 million you’d need for a Cray-2 in 1985; and back then, $16 million was a lot of money. The Cray did look awesome though. VAX-11/780 was the engineer’s choice of minicomputer – much like the Pi today perhaps. However with only a single 5MHz CPU and a maximum of 8MB RAM (that’s MegaByte, not GigaByte, kids) I think the Pi would run rings around the old beast. The VAX would win if it was a sumo competition of course – the CPU cabinets alone weigh in around a metric tonne. SGI were sold as graphics workstations but I suspect that by today’s standards even their highly-tuned graphics subsystems would be outperformed by the GPU in the Pi. The baby O2 (single 400MHz CPU and 1GB RAM) wouldn’t scare the Pi2 but the bigger Octanes with dual 600MHz MIPS processors and 8GB RAM might give the Pi a black eye. But side-by-side? the graphics on the Pi would outshine what were the best of the 1990’s desktops. The SPARCstation 20 seemed great at the time. It could support quad RISC processors, but only at 200MHz, so round 1 to the Pi2. Maximum memory? 512MB. Round 2, Pi2. Built-in Ethernet? 10Mbps only. Round 3, Pi2. Graphics? Knockout blow by the Pi2. With a full spec SS20 costing well over $20k back in 1995, it’s an easy win for Raspberry Pi. Computing is an area where the products get old, fast. I have a collection of old machines (including small VAXen and SPARC hardware) but it’s hardly worth the electricity to turn them on nowadays. They deserve to be preserved as they are part of our journey but we have come a long, long way in one human lifetime. My first computing experience was playing Lunar Lander on the GT40 front-end processor of a DECsystem-10 in about 1975. I can’t begin to guess how much that configuration cost! Anyways, if the Pi can deliver the same magical experience to a whole generation of budding computer scientists, programmers and designers then I’d say the Pi wins hands down. You owned a VAX? I’m impressed. I owned a PDP-11/03. Lovely machine. It was actually a Heathkit H11 and I assembled the power supply, backplane and case myself. The architecture was so simple that you could program it in assembler and feel like you were doing magic. An emulator on the Pi would run many times faster than the real thing. 64k of RAM fully stacked (for an outrageous amount of moolah), and I had 2 x DSD440 (RX-02 lookalike) disk drives for a whole 1Mb of floppy disk! Those were the days. I would like to see the I/O system benchmarked. How limited is the combined USB-Ethernet bus? 1) On the hard drive side, running hdparm -t /dev/sda1, and getting almost exactly 30MB/s or 240Mb/s !!! 2) On the network side, the internal 100Mb/s Ethernet has already maxed out at greater than 90Mb/s speeds. 1) dd a large file on a fast USB flash drive, to /dev/null, and time it. 2) Connect a USB Gigabit LAN adapter to the RPi2, and connect the LAN to a PC. Run iperf on both the PC and RPi2. 1) dd a file on a fast USB flash drive, to another fast flash drive. 2) Install 2 USB Gigabit LAN adapters on the RPi2, and setup a network bridge between them. Connect the LAN to two PCs, and run iperf on both PCs. 3) Setup a Samba share using a fast USB flash drive through a USB Gigabit LAN adapter. Buy one! You can easily do those tests. I’ve got the Amazon gift cards just waiting for them to drop below $70. The [email protected] benchmarks are a bit confusing and/or disappointing. The Pi 2 comes up only a tad faster than the Pi 1 (basically about the ratio of the clock frequencies). This could be because they are per-core benchmarks, in which case I should get 4+ times the throughput in the long run, or it could be because the cores are sharing the integer and floating poiint units (which would seem a bit pointless). I haven’t yet done enough [email protected] work on the Pi 2 to get a throughput score. It will take a day or two. I’ll post an update when the picture is clearer. Is it possible to overclock Raspberry Pi 2? How much range could I got to overclock it? I’ve a RPi 1B and I overclocks it to 800MHz. I tried a very unscientific test of running my version of Life. It calculates an area of 704 X 450 and wraps at the edges, I did a timing run for 9000 generations. Both Pies were set to the came cpu, core and clock speeds, with no X running, and as far as I’m aware only a single CPU was used on the Pi 2. On a Raspberry Pi B it completes 9000 generations in 20 seconds. On a Raspberry Pi 2 it completes 9000 generations in 7 seconds! This seems surprisingly good as it’s exactly the same code, which I had optimised as much as I could, with exactly the same CPU frequencies, I can only think that because of the larger internal cache, the whole of the program plus array storage can fit in the Pi 2 cache and it couldn’t in the Pi B. Obviously it still has to slow down to do the screen updates, which presumably will have to be in main memory. While I’m on the subject, I used ‘cc -O2 life.c’ to compile this, can anyone tell me if there are any better options I can use for the Pi 2 as it’s an ARM 7? I did a quick and dirty test and it only seemed to use one core. Is it compiled with multithreaded options? Guys – I have very slow video playback (tested on Buck Bunny 1080p) on rpi2 using both openelec and OSMC. About 10 fps with acceleration on (cores about 10-15% of load and 0% of vpu), when I switch off acceleration fps drops even lower (more cpu usage, and no vpu load). Any ideas? That’s definitely not right. Have you updated your firmware? Liz, what you mean by updating firmware? Did a benchmark of the rupy cometstream and 6x it is. Almost the same performance as an old atom or a new NUC, but per watt it dominates! I would have jumped at getting one already, but it’s just a small bored with everything on it, and i don’t have the tools needed to make a casing for it, i wish i did.. but i don’t. REALLY wish i had a 3D printer. A quick google search will show you that there are dozens of 3rd-party cases available to buy for the Raspberry Pi. Thanks to the same form-factor (almost) every case for the Pi B+ will also fit the Pi 2. 1) Created a simple python script to calculate the first 50 Fibonacci numbers. I do this 1000 times and then print out the average duration of the 50 calculations. 4) Observed that the B+ calculation time got slower and slower as I added SSH sessions while the Pi2 seemed unaffected. 5) Final values: B+ .00844, Pi2 .00138 -> 4:53:1 performance improvement for the Pi2. 6) Note that when I added a fifth SSH session to the Pi2 and ran the script, the timings finally took a hit. So I think it’s safe to say that those four cores make a difference. I’ve posted a detailed comment on the forum about the performance improvement I noticed when using a testbench for an in-memory database – see http://www.raspberrypi.org/forums/viewtopic.php?p=689575#p689575. 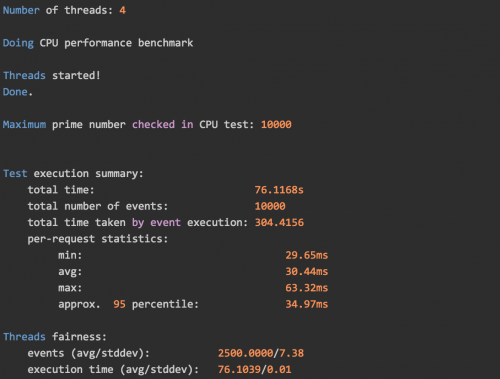 Basically, without any recompilation or over-clocking, I saw 4-fold performance improvement for single-threaded sets, and 6 to 8 times better when using multiple connections to the server. time echo "scale=5000; a(1)*4" | bc -l"
for the delight of the rest of us who don’t own a RPi 2 yet? So the Pi2 was about 4.8x faster than the Pi, but there is still a big gap to the desktop computer. The two Pi’s were not using the same SD card, but I think most of the difference is CPU rather than ‘disk’ performance. Python2 ran from the IDLE. No multi-threading in the script. I should have said that the old Raspberry Pi was a model B with 512 MB of RAM. When I repeated the test on the Pi using the same memory card as the Pi2 had used, the elapsed time was 202.5 seconds reducing the Pi2 to 4.6x the Pi. Could somebody take timelapse photos of the Pi camera on the Raspberry Pi 2 model B and give me the smallest number between 2 shots without the delay? In Raspberry Pi 1 mode l B+, I need at least 1.7s between 2 continuous shots. This question is better asked (and already answered?) on the forums. I ran some more benchmarks. B+ work well :5 to 7 fps quite good for me and my application. so i think with pi 2 my program get well. This isn’t the right place for tech support – please post your question in the forums! Please post on the forum for tech support. When gzipping a file, I found the Pi 2 to be 3 times as fast as the Pi 1 (single-core), and about 8.3 times as fast using 4 cores. When computing checksums of large files, the Pi2 is again 3 times faster than the Pi1, and over 15 times faster using 4 cores. It would be nice to have some kind of standard benchmark for testing SD and microSD cards inside the Raspberry Pi itself. There are many methods around the net… we need a standard one so we can compare. Has anyone run RISCOS Pi on the Raspberry Pi 2? I’d like to know what people think of it, vs. that OS running on the Raspberry Pi 1. How much more responsive is desktop performance (window moves as well as resizing, opening/closing, etc.) and other aspects, including Web Browsing?